I’m seeing love stories everywhere. Like these two kids. We find them here on the Century Walk as they are making each other’s acquaintance. They are about eight years old and they are in the same Grade 3 class. It’s funny that they haven’t met yet, since their roots in this town go so deep. Billy’s family established a hardware store in the 1800s, and Jane’s family founded Naperville itself. Billy will be a high-school basketball star and she’ll be his sweetheart. He’ll become a civil engineer; she’ll found a kindergarten program. What we are witnessing might be the first time they are having a conversation, but they have decades of conversation ahead of them. They will marry in 15 years, in 1941, and be together for 60 years, till Billy’s death in 2001. Jane, who spent the first eight years of her life without him, will spend the last ten of her life also without him. 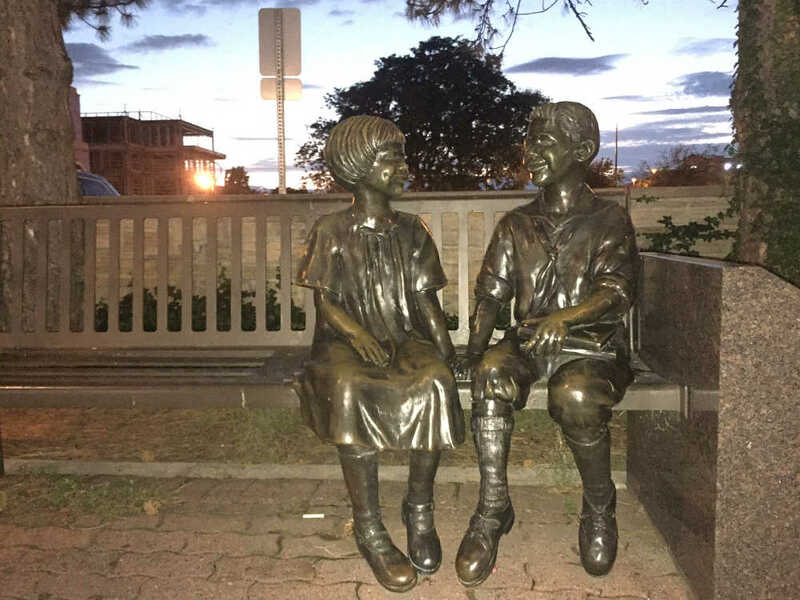 They are remembered through local scholarships, and this park bench where maybe, one day, two children will start a conversation that will last a lifetime.